Spell Reel (2017). Image courtesy of Spectre Productions. This event was recorded. Please view the discussion here. By turns political documentary, archival history, and lyrical exploration of the relationship between past and present, Filipa César’s 2017 film Spell Reel presents a trove of footage taken during Guinea-Bissau’s war of independence from Portugal (1963–74) in West Africa. Shot by four young students at the request of revolutionary leader Amílcar Cabral, these deteriorating film reels were nearly lost when 60 percent of them were destroyed during the country’s 1998 civil war. In 2012, César began working with the two surviving filmmakers, Flora Gomes and Sana Na N’Hada, as well as Berlin’s Arsenal-Institute for Film and Video Art, to digitize the remaining footage. These reels include mesmerizing images of rural education, guerrilla warfare, and the construction and celebration of a new country. Throughout, black and white fragments play over the film’s current-day scenes, capturing rhymes between the present and the irretrievable past. 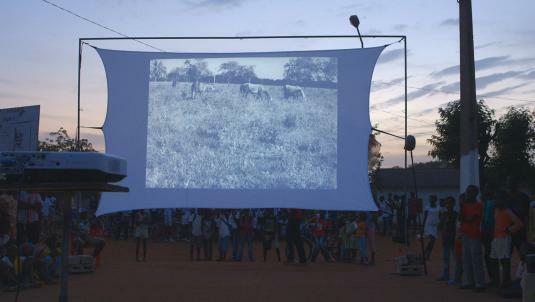 In the contemporary scenes, César and her collaborators create a transnational itinerant cinema, projecting and narrating the footage for crowds across Europe and Guinea-Bissau. As audiences participate, speaking back to the film and their fellow spectators, the “revolutionary films” provide a space for political response—whether in the form of hopeful expressions for Guinea-Bissau’s future, critical assessments of the state of the world, or lingering colonial attitudes. In other words, these film fragments become, as César calls them, a “visionary prism”—offering a new lens on a world in crisis. Following the screening, director Filipa César will discuss the film with Kate Rennebohm, a Ph.D. candidate in film and visual studies at Harvard University. Co-sponsored by the Film Study Center at Harvard University and the Harvard Art Museums. The screening will take place in Menschel Hall, Lower Level. Please enter the museums via the entrance on Broadway. Doors will open at 6:30pm. Free admission, but limited seating is available. Tickets will be distributed beginning at 6:30pm at the Broadway entrance. One ticket per person.